The opening round of the season is now over and the nerves have hopefully gone. 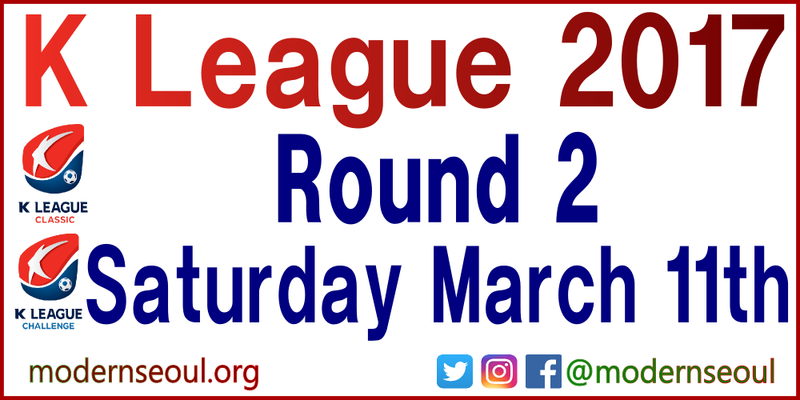 Moving onto the second round of the season and Super Saturday of 6 games (4 Classic + 2 Challenge). All 4 of the teams involved in the Champions League are involved so it should be a quality afternoon. Of course following just a single game the league table doesn’t reflect a probable final table, but it does make of nice viewing for a few sides. Gangwon, Jeonbuk, Ulsan, Gwangju and Jeju lead the way all winning their opening games. 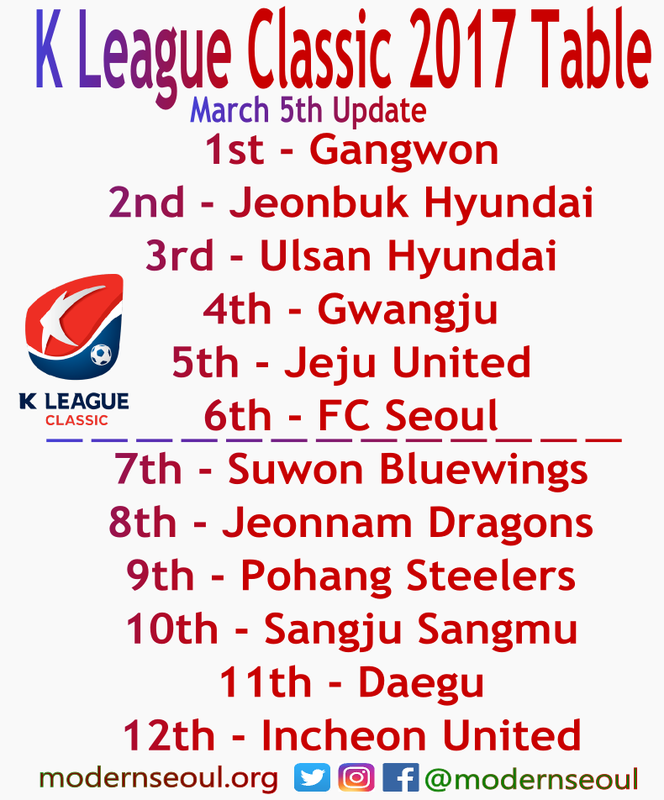 FC Seoul and Suwon Bluewings make up the mid-table. Whilst Jeonnam, Pohang, Sangju, Daegu and finally Incheon comprise the bottom 5. The early game of the day comes from Daegu, Daegu’s first home Classic game since 2013. They lost last weekend in a dull game v Gwangju. Incheon United also lost last weekend at home to Jeju. Last Time: Incheon won 2-1 back in July 2013. Neither side looked 100% ready for the new season last weekend and sadly this could be another dull draw. Fingers crossed we’re wrong. Our highlight game of the day comes from the Suwon World Cup Stadium (Big Bird). Suwon Bluewings drew last weekend in the super match 1-1, they’ve also drawn twice in the ACL so far this season. Jeonbuk Hyundai won the Jeolla Derby last Sunday, thanks to a last minute Kim Shin-Wook winner. Last Time: 1-1 in September, overall Jeonbuk have won more. A very close game on paper, but we see Suwon at home having the slight edge. An all Champions League competitors clash between Jeju and Ulsan. Jeju United won their opening game of the season on the road against Incheon. Ulsan also won beating Pohang Steelers in a South East coast derby. Last Time: 0-0 last November, overall Jeju have the slight edge historically. Having watched both of these sides play a few game already this game, Jeju United certainly look the most consistent. However they might rest players with ACL games taking place next week. The first game of the season from the Alpensia Ski Jumping Stadium home of Gangwon FC. 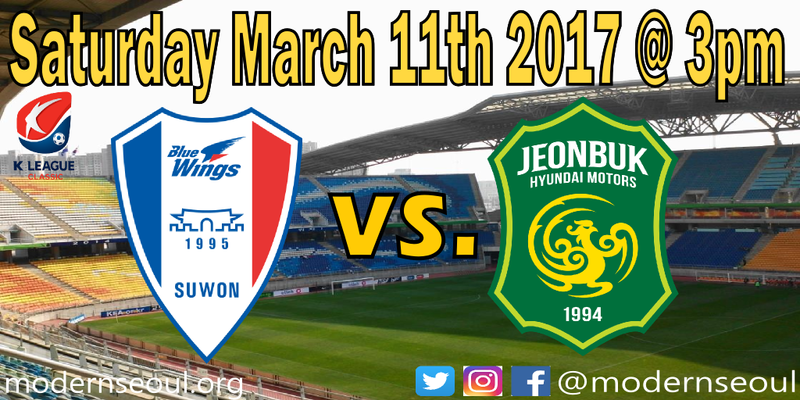 Gangwon won their opening game of the season beating Sangju Sangmu 2-1, Lee Keun-Ho scored both goals. FC Seoul drew their opening game 1-1 in the Super Match against Suwon Bluewings. Head-to-head gives Seoul a 9W 1L advantage, last time: FC Seoul won 0-1 back in July 2013. Seoul will be heavy favorites, but Gangwon proved last weekend they can defy the odds. Incheon comeback from 2 goals down, Jeonbuk control Suwon, Jeju hammer Ulsan and Seoul edge Gangwon. 3/4 result predictions but no perfect scores. 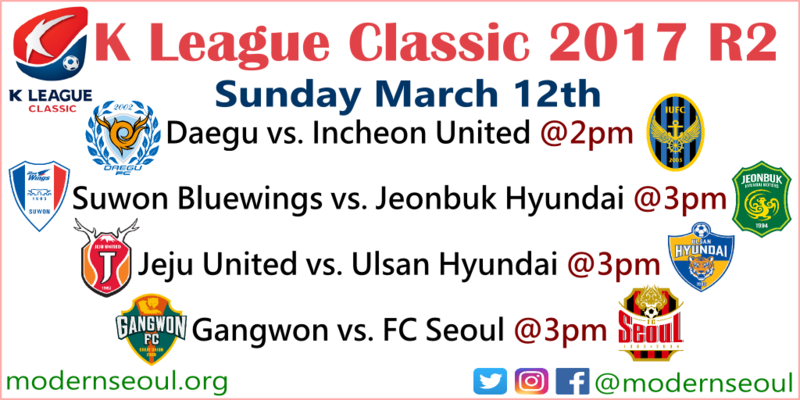 Saturday afternoon also features a couple of games in the K League Challenge. 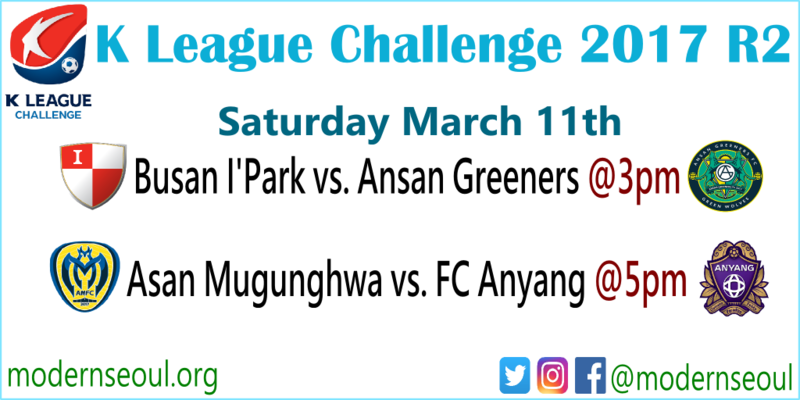 Firstly Busan I’Park hosting Ansan Greeners and then Asan Mugunghwa hosting FC Anyang. 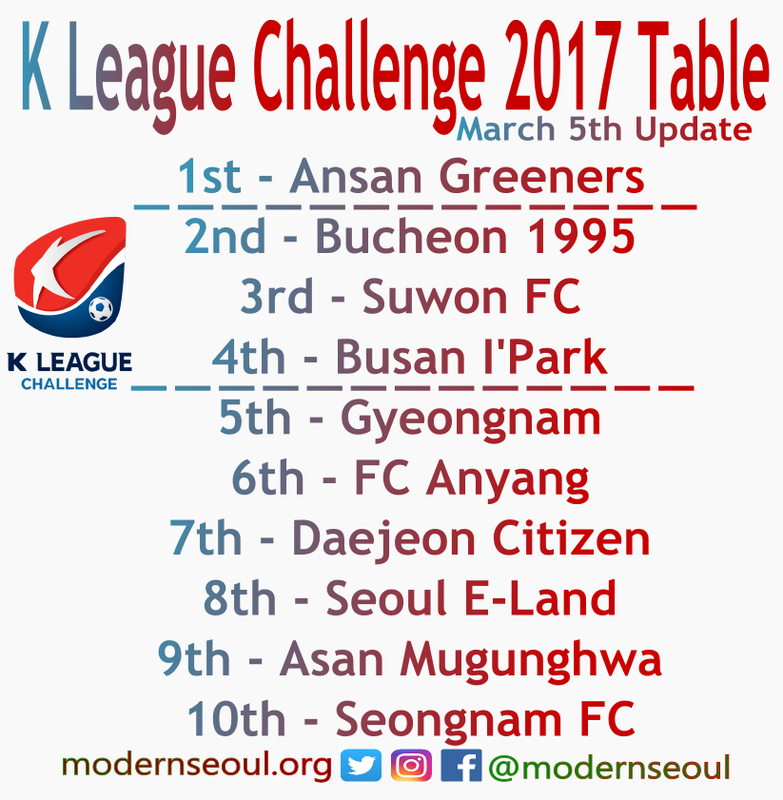 The league table after just a single game as Ansan Greeners leading the way, level on points with Bucheon, Suwon FC, Busan I’Park and Gyeongnam. 5 sides are pointless after last weekend FC Anyang, Daejeon Citizen, Seoul E-Land, Asan Mugunghwa and finally Seongnam FC. This could easily flipped around after this weekends round of games. The first game in the Challenge this Saturday afternoon comes from the Busan Gudeok Stadium. Hosts Busan I’Park won their opening game a slight upset against recently relegated Seongnam. Newly formed Ansan Greeners also won last weekend in their first ever K League game, beating Daejeon Citizen. Busan looked solid last weekend and at home should have the edge. However Ansan are still a little unknown, so it maybe close. 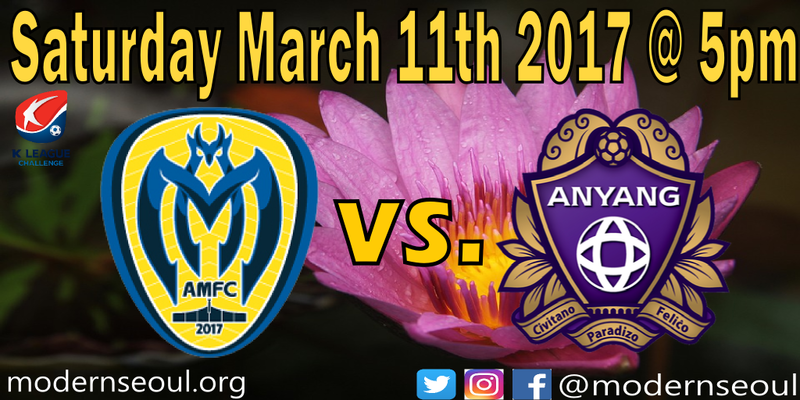 This Saturdays late game features the the Korean Police under their new name Asan Mugunghwa, hosting their first ever game. Also the first ever game in the city of Asan (Yisunsin Stadium). They lost their opening match 1-0 against Gyeongnam. FC Anyang also lost on the opening weekend, conceding in the dying moments against Suwon FC. Judging on their opening weekend performances these sides will be evenly matched and therefore a draw seems like the likely outcome. Busan continue to look like the early front runners.